As per our collective minds; music is a universal language which is spoken and written around the globe. 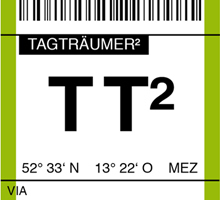 With his backpack loaded with records and his mind full of ideas, Tagträumer² has been exploring foreign countries and undiscovered sounds. Eight years have passed on his seemingly endless journey. Through different people, extraordinary situations, adventurous experiences and unknown vibes an elixir of magic is created. It is the engine and the resource that drives his artistic inspirations. Tagträumer²’s musical path has led him to over a dozen countries, including those which no longer are counted as electronic driven societies. Most notably are his events in countries such as China, South Korea, Belarus, Turkey, Ukraine and Serbia which have enriched Tagträumer²’s experiences and are reflected in his tracks and DJ sets. His work tells us stories about forward moments during the cold nights at the Great Wall of China, and about weightless festivals on Crimea in the middle of sparkling Salt Lakes, and of the parties surrounded by the never ending neon light in Korean bars. Back home in Berlin, Tagträumer² processes his gathered impressions in his productions which are released on several different labels. But of course, his productions are also released on his own vinyl and digital record label “BlackFoxMusic” (blackfoxmusic.com) that Robert launched in 2007. The label management’s activities also expanded onto Schallbox Rec. and Neopren. In addition, the Berlin artist focuses his creative output as a DJ, for which he exclusively uses Vinyl. Regardless of how heavy his backpack may be on his future journey to Belgium, Kamchatka, or elsewhere, as long as there will be some turn tables in place, any booking requests are welcome.